Boris Vorontsov has released a new version of his ENBSeries mod for GTA V, which adds programmable external shader for light sprites enblightsprite.fx, two types of light sprites which work only when external shader is disabled by new parameter, as well as a parameter to ignore damage limits. The new version of the GTA V ENBSeries can be downloaded from here. “Added programmable external shader for light sprites enblightsprite.fx, check shader editor window for parameters of example. Added two types of light sprites which works only when external shader is disabled by new parameter. When Type=0 selected, original game shader is used. Currently Type=1 is eye specific rainbow glowing, Type=2 is kinda anamorph. Both shaders use depth texture to clip by center of each sprite instead of z-buffer. I’ll improve these and add another shaders later. 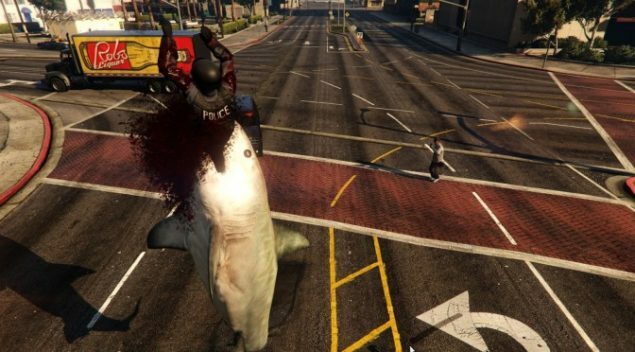 JulioNIB released a new mod for GTA V that brings a gun inspired by the Saints Row games, the Shark-O-Matic. Another ridiculously cool Grand Theft Auto 5 mod following his GTA 5 – Just Cause 2 Grappling Hook mod. The mod features a large great white shark jump out and swallow its victims, which does indeed look quite awesome. You can download the “Shark-O-Matic Gun” mod from GTA5Base. GTA Series Videos has provided a nice Mod showcase for Grand Theft Zombies Mod, made by GTZDevs.